Today’s schedule was at Huntington Beach — the fourth and final interview for Team Picture Bride. We organised to meet Julia Tafel and her family at her house, and was also invited to a bbq party with her son and daughter’s family also present. Julia Tafel is a third generation Japanese American with a picture-bride grandmother in her family. When we arrived at her front door, she excitedly came and clasped each of our hands with a welcoming handshake. Her house was tastefully decorated with artworks and photographs framed and covering all the walls. Stacked on the dining table was a very well-kept collection of photo albums and scrapbooks ready for the interview. 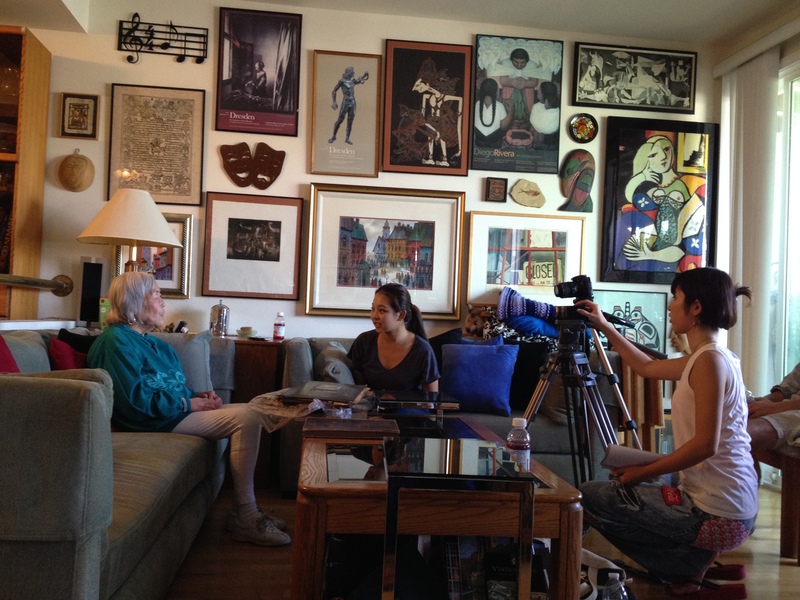 We began our interview with Julia, and learnt about her grandmother, and how she had come to America as a picture bride. Without revealing too much, her grandmother was the eldest of 13 children, and was eager to leave for America hearing of the opportunity. Before we had realised, the house became packed with people. Julia’s daughter, and her husband and two children, and Julia’s son, and his wife and daughter, all arrived. After interviewing Julia we invited her two children to be interviewed, followed by their children, on their views of marriage. After finishing the interviews, the party began. Food and drinks and interesting conversation ensued as the sun began to lower into the horizon, creating one of those views that make you want to just abandon school or work and get ready to live in California for the rest of your life. Looking around at how easily this family had included us and opened their private home to us, we truly felt like we had met good people on this trip. We have been lucky enough to meet and learn from people, and experience moments that we would never be been able to otherwise.